When players talk about Modern’s “high power level,” they are generally referring to how hard it is for Standard-legal cards to break into the format. After receiving archetype-spawning hits in Oath of the Gatewatch (Thought-Knot Seer, Reality Smasher), Shadows Over Innistrad (Nahiri, the Harbinger, Prized Amalgam), and Eldritch Moon (Eldritch Evolution, Bedlam Reveler), it’s a little disheartening to leaf through the Kaladesh spoilers a week after the set’s release and realize how little an impact the set has made in Modern. Well, fear not! Chandra, Torch of Defiance might not be Jace, the Mind Sculptor, but she still packs a serious punch and may be the card Modern best remembers Kaladesh by. I mentioned Cathartic Reunion‘s possible applications in a Chalice-based GRx Moon deck last week, and am now happy to unveil the fruits of that idea. Chandra herself makes an appearance in that deck, and also updates the dork-based builds of GRx Moon I last worked on when Goblin Dark-Dwellers came to Modern. It’s been a while since I visited this archetype, so let’s do a quick refresher. GRx Moon is a midrange deck that ramps into an early lock piece (often Blood Moon) and closes games out with heavy-duty threats (often Tarmogoyf or Huntmaster of the Fells). The nature of Blood Moon gives it extra points against mana-hungry strategies, including other midrange decks, in exchange for the early disruption of Inquisition of Kozilek we see from Jund. Looting effects are employed to help with consistency and grow Tarmogoyf. When I introduced GRx Moon to Modern Nexus, the deck didn’t have a proper analog in Modern. I’d adapted the deck from Skred Red after having adding green to that deck for Tarmogoyf. Today, another deck exists that plays similarly: RG Ponza. Ponza is a Stone Rain deck that rides mana advantages from Arbor Elf and Utopia Sprawl to power out Inferno Titan and Stormbreath Dragons, all with a turn two Moon in play. I don’t like how soft these decks are to Bolt effects, and especially to sweepers—if Arbor Elf gets taken out, it takes the Ponza deck five to six actual mana cards (be they lands or Utopia Sprawls) to start casting threats. Mana Leak also ends the deck. GRx Moon has great insurance for dead dorks in Tarmogoyf, and stops its curve at four mana for threats. Extra mana sources (or disruption) can be cycled into more threats with Looting effects, or just played to get around taxing permission. There are two ways to build GRx Moon. The first involves fast-mana effects like Desperate Ritual and Simian Spirit Guide. This build is more explosive than dork versions, but less consistent and limited to a lower curve. The main attractions to playing rituals include not ceding too many points to Lightning Bolt (which is really good at killing Noble Hierarch) and gaining the ability to run Chalice of the Void. Dork-based builds use permanent acceleration like Noble Hierarch, Birds of Paradise, and Utopia Sprawl to get ahead on mana for the duration of a game. These decks are easier to disrupt with removal than ritual versions, but are more resilient against targeted discard and play a stronger long game. Interested readers can get more on the subject here. One historical problem with GRx Moon is that it has sometimes lacked adequate threats. Tarmogoyf and Huntmaster of the Fells are great, but we can only play four of each. Beyond those, I’ve dipped into threats as diverse as Goblin Rabblemaster and Siege Rhino to round out the suite. Traverse the Ulvenwald helped us out greatly, allowing us to play more functional copies of our eight core beaters. So did Nahiri, the Harbinger. Each solution came with a problem: the former made us softer to graveyard hate and the latter pulled us into a third color. Chandra, Torch of Defiance evades these pitfalls, all while working under Chalice, not bringing us above curve for our looting effects, and attacking opponents from a unique angle, just as Tarmogoyf and Huntmaster do. I expect her to remain a staple in GRx Moon decks going forward. GRx Moon leans on the principle that an unexpected Blood Moon ends games more often than any other hate card in Modern. Chalice of the Void takes second place, though, so we’ve included that, too. Chalice of the Void: Simian Spirit Guide allows us to power out Chalice on turn one, a play that put Eldrazi Mimic on the map in Modern during Pro Tour Oath of the Gatewatch and continues to reward players who run the combination. Dismember: It’s natural that opposing threats slip under a turn three enchantment. Chalice of the Void prevents us from playing Lightning Bolt, but Dismember does the job just as well in most matchups (Burn being the obvious exception). The Phyrexian removal spell has the added bonus of killing fatties like Thought-Knot Seer and young Tarmogoyfs in addition to Wild Nacatl, Restoration Angel, or a simple mana dork. The card is hugely versatile and I’m liking it more and more for streamlined aggro decks in need of removal that can’t access Bolt. 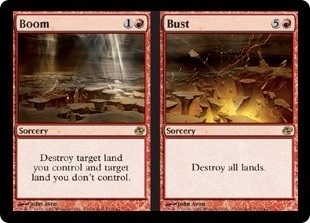 Allow us to cast Boom // Bust on turn two without losing a land. Pump Goyf and help with delirium when discarded by Cathartic Reunion. Pump Goyf and help with delirium when blown up by Boom // Bust under a Moon. The last case is admittedly fringe, but the turn two Boom // Busts are often crippling for opponents. Even if we have to shoot a shock land, many opponents will use their next land or two to fetch up more shocks anyway, since they need their colors badly to have wanted to lead with a shock in the first place. Citadel might enable Boom // Bust, but the card has applications on its own. At worst, it trades one of our lands for an opponent’s, which is potent with a Moon in play. Picking off an opponent’s precious basic lands makes our enchantments even more valuable in the mid-to-late-game. The Bust mode has never been that relevant in ritual-based GRx Moon decks, but Chandra, Torch of Defiance changes that. Her ability to double as a Hedron Archive (all while gaining loyalty!) gives Boom // Bust new relevance as a card that threatens Armageddon once the planeswalker get going. And with Chandra in play, we’re likely to recover before opponents do. One thing rituals have over dorks is they allow us to spend more mana in the first two turns of the game. Lines like turn one Dismember, turn two Blood Moon simply aren’t possible with a Noble Hierarch as acceleration, which can be relevant on the draw against aggressive decks like Infect. Simian Spirit Guide: A costless ritual that enables turn one Chalice and starts beating if it needs to. Too bad we can’t play eight of these guys. Desperate Ritual: Something of a necessary evil in this deck. I tried playing without Rituals too, but wanted the extra ramp too much to continue excluding them. For a time, I figured dorks had so many benefits over rituals that playing one-shot mana in GRx Moon was just wrong. I eventually tried rituals in the archetype, which for the large part vindicated this assumption. I came to the conclusion that the main reason to play rituals was access to Chalice of the Void. But without access to a filtering tool like Faithless Looting, to dig past not just extra Moons but extra Chalices and ritual effects, the deck never got off the ground for me. Enter Cathartic Reunion, a card leagues more efficient than Tormenting Voice that might remedy this issue. Reunion’s main benefit is that it doesn’t put us down a card unlike Faithless Looting, making it significantly better against decks with targeted discard. Those decks could tear our hand apart after we -1 ourselves to set up on the first turn. With Reunion, they have a much harder time. Granted, Reunion is much worse against countermagic. But I don’t think that’s a significant issue. As long as we prioritize resolving Reunions and are careful not to walk them into a Remand, this drawback is mitigated. On to what the card actually does. In a longer game, Reunion cycles away two dead cards, compared with Looting’s four, and sees three new ones, compared with Looting’s four. Looting still seems like the better of the two cards to me in this archetype, but Reunion definitely comes close to it in terms of new cards seen, and at a smaller number-of-cards downside. Of course, the card’s main benefit is that it gives a filtering tool to a deck that desperately needed one, since Chalice doesn’t allow us to play Faithless Looting. Nahiri, the Harbinger gives GRx Moon something it rarely has access to: a surefire way to kill enemy Tarmogoyfs. She exiles anything that attacks us and clocks slower opponents by herself. Emrakul nonbos with Traverse, but Nahiri’s looting ability lets us cherry-pick which cards to bin, turning on delirium very quickly. Once we reach four mana, fair decks have a terrible time interacting with us, since we’re just slamming haymakers non-stop. The obvious draw to dorks over rituals is that the mana actually sticks around, allowing us to play more high-curve spells. Noble Hierarch: Birds definitely makes it easier to cast Chandra. But having a searchable way to apply more pressure and break Goyf stalls, all on a mana dork, is pretty silly. There’s a reason Hierarch is consistently one of the highest-played creatures in Modern. Utopia Sprawl: The dork that never dies to Bolt. We need to put it on a Forest so Blood Moon doesn’t cause it to fall off, but that’s hardly an issue with so many green basics and fetches in the deck. Naya Moon gets to play Faithless Looting, by far the most efficient digging tool GRx Moon has access to. Nahiri, the Harbinger also helps a great deal with consistency, as does Chandra, Torch of Defiance who allows us to see twice as many cards per turn. Traverse the Ulvenwald rounds out our consistency suite, searching for any creature in the deck once delirium turns on. That includes impossible-to-kill threats like Stormbreath Dragon and flexible answers like Reclamation Sage after siding, as well as a Moon-on-legs in all three games. Between these 15 cards, Naya Moon has a great time finding what it needs, when it needs it. I’m not finished experimenting with GRx Moon—I’ve got a third build in the works with Goblin Rabblemaster and Ghor-Clan Rampager. But these two builds have been testing well for me this week. 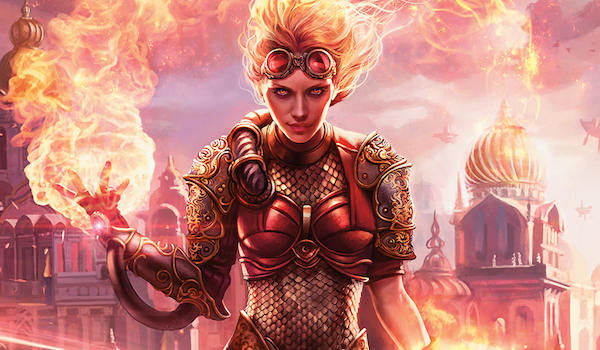 My advice to readers sulking after Kaladesh’s admittedly uninspiring offering of fresh meat: just give Chandra, Torch of Defiance a little time. I’d be surprised if we didn’t see her surface as a one-of in certain Jund and Jeskai lists, and it’s possible she gives fringe archetypes like Skred Red or GRx Moon the boost they need to claw into the tournament scene. Nice. I literally just resleeved your RGx Moon list from earlier this year (the version without chalice or guide), with some minor modifications. Do you think GRx Moon without the chalice lock is viable? Maybe slotting in new Chandra might increase the threat levels, but it might be hard with the mana base. The Naya version looks interesting to try. I do, and I think it’s actually better than the Chalice versions right now, despite how linear Modern is. Lightning Bolt is currently very strong. I will say that this has not come up for me yet, but I guess it is possible! Anything that has maindeck Chalice of the Void and Blood Moon certainly has my attention, especially when it’s also employing some juicy new cards like Chandra, Torch of Defiance, so I’m more interested in the ritual-based version of this deck. I am a bit worried about the deck being a bit threat-light, though. Do you think the ritual-based manabase is capable of supporting a big haymaker like Stormbreath Dragon? Not really. 5 mana is a lot to ask in the ritual decks since we stop making land drops after about three. It’s more feasible in the sideboard for now. In the meantime, I really like Goblin Rabblemaster’s current positioning against all the solitaire decks, especially in a deck with Chalice of the Void. Big fan of these sort of Blood Moon Stompy lists. I’ve wanted to build one for a while, but I don’t have access to any ‘Goyfs. I’ve tried out RW Lock decks but they have such a hard time closing the game out before you opponent wiggles out from under your lock pieces. Do you think black could provide reasonable threats to fill in for green? Bitterblossom is a bit slow but hard for most decks to remove under Blood Moon, and adding Reunion to the rituals and fetchlands could make Tasigur/Gurmag Angler castable. It would also give you access to Terminate and Col Brutality (and other discard). Heck, Pack Rat could be a decent threat here. I don’t. If you want to play a GRx Moon deck without Goyf, I would advise going the Ponza route. That sticks you firmly in the ramp camp, though. Goyf is necessary in the stompy lists IMO. Have you also abandoned the toolbox concept for Traverse? Before your SB was a toolbox of creatures. It seems youve gone back to a conventional build. I wanted the spells more. Stone Rain, Dismember, Anger, and Choke all plug critical holes in the strategy. The Traverse build above still employs a minimal toolbox of Stormbreath Dragon, Reclamation Sage, and Magus of the Moon, but most of the time we just want to search up Tarmogoyf. Cute techs like Thrun end up being superfluous. I have been going back and forth between the third Rain and Avalanche Riders, though. It’s nice to have a searchable way to blow up a basic, even if it is expensive. I was thinking the same in terms of toolbox for this strategy. It ended up being too cute in practice. Good to know I was on the right track. You could also use traverses delirium mode to fetch utility lands like ghost quarter if you found a need for more traverse targets. SSG I personally think is unhealthy for the format. Chalice I personally think is unhealthy for the format. Blood moon I personally just don’t like, but can be a little more understanding of. The new Chandra, if she does anything, will weaken the formats health. A top 3 decks of affinity, infect and burn is kinda bad but they have been powerhouses since modern began. If this is what we are left to build then I’m kinda dissapointed. Not to say it’s a weak build. Ultimately I enjoy Grixis, Jeskai or UW control. And it just feels like fast decks run the show and that’s where the innovation is. We just keep getting enablers for speed like Chandra or dredge cards. Note blossoming defense in a recent infect top 8. Eldrazi was gross, though I love the current iteration of Bant. I want to see more incentive to grind and it’s just not being printed. The solution isn’t the b and r list either. I still love modern though. This article has nothing to do with “format health,” but I think this is such a problematic sentiment that I’ll bite. Wizards has hard and fast rules when it comes to maintaining format health (from their perspective, which is the only one that matters) and all of them involve metagame representation. Simian Spirit Guide, Blood Moon, and Chalice are not cards that find themselves in top tier decks with any sort of frequency, so rest assured they aren’t going anywhere!